As Baselworld 2014 approaches Girard-Perregaux has just released a teaser video for its new Tri-Axial Tourbillon, the first such tourbillon from the brand synonymous with the iconic Tourbillon with Three Gold Bridges. 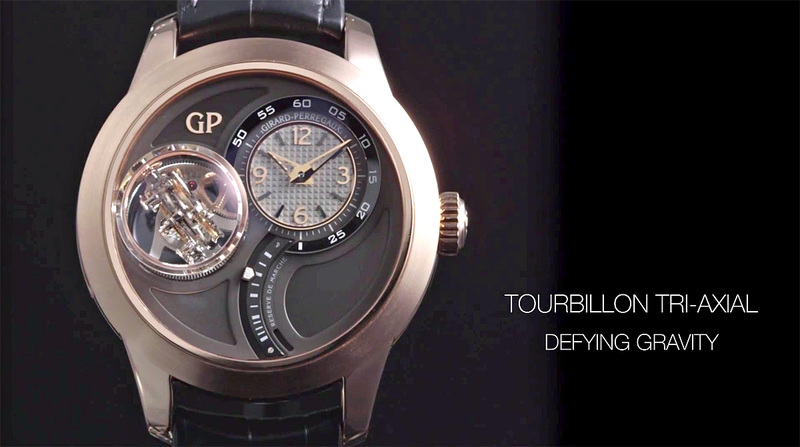 In a couple of days Girard-Perregaux will officially unveil its first Tri-Axial Tourbillon at Baselworld 2014. Shown in the teaser video below, the watch features both a triple axis tourbillon and a power reserve indicator, along with an off-centre time display at two o’clock. Having already developing a double-axis tourbillon, this is the first triple-axis tourbillon from Girard-Perregaux. Seemingly large, likely 44 mm or so, the watch uses the President style case (named after a wristwatch made for the President of Ferrari back in the nineties). The design is contemporary, taking after the Constant Escapement, but somewhat reminiscent of the Jaeger-LeCoultre Spherotourbillon. The triple axis tourbillon (Vianney Halter presented the most recent triple axis tourbillon last year) is at nine o’clock, sitting under a sapphire bubble, much like the Zenith Christophe Colomb Hurricane. More details will be revealed at Baselworld 2014.